Class Play "Cheaper By The Dozen"
Coming of age in Warrenton"
The Warrenton High School Class of 1963 recently held their 50th reunion at the Best Western Oceanview Resort in Seaside. Twenty-five of the 43 classmates attended. The highlight of the evening was a video of pictures from the students' grade school and high school years put together by Ken Ostgard. Ken was also the emcee for the evening. Another highlight was the presence of Gerd Opedal, the foreign exchange student from Norway during the 1962-1963 school year. Gerd, her husband Hans, and son Jon Albert, traveled from Norway to attend the reunion. Those who traveled from farthest away were Kristine Anderson from West Lafayette, Indiana, and Max Kempt from Copperas Cove, Texas. 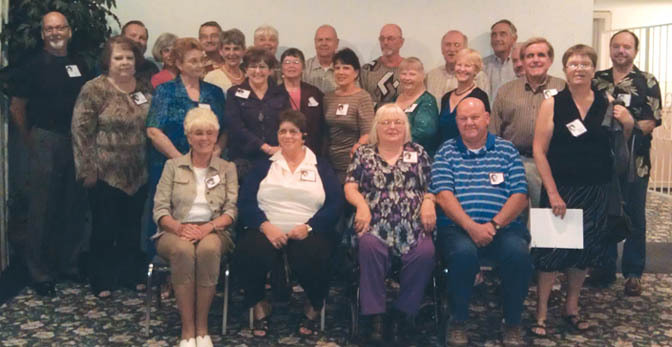 The reunion committee consisted of Ken Ostgard, Darlene (Haerer)White, Pam (See) Van, Sue (Henry) Ensign, Neva Jo (Fenton) Suhadolnik and Shirley (Knotts) Hutchens. A big "Thank You" goes to Sue (Henry) Ensign for her help with creating the Warrior booklet and designing the cover. And also, Linda Fenton-Mendenhall for making the table decorations. Pictured above, back row, left to right: Mike Larsh, Toby Potter, Pam (See) Van, Earl Van, Gerd Opdahl, Dianne (Cameron) Watkins, Bill Shaw, Warren Hubbard, Terry Johnson, Jim Cordell and Rod Black; Middle Row, left to right: Shirley (Knotts) Hutchens, Alice (Olney) Jones, Neva Jo (Fenton) Suhadolnik, Kathy (Dunning) Depping, Michele (Kobrzycki) Thomas, Diane (Bushnell) Black, Meri (Anderson)Stratton, Ken Ostgard, Kristine Anderson and Mike Thompson; Seated, left to right: Darlene (Haerer) White, Sue (Henry) Ensign, Kathleen (Thompson) Cratty and Max Kempt.